In my patrolling of the internet and Facebook, I stumbled upon an interesting series called the Next evangelist. I am not sure how I feel about this particular series. For those of you who do not know, and I am sure that there are many out there, this series is a venture of the Christian community into the world of modern reality television. (I use the phrase modern because if you think about it Christians invented reality TV when we began airing church services on networks, but I digress, that is another topic I have yet to flesh out.) 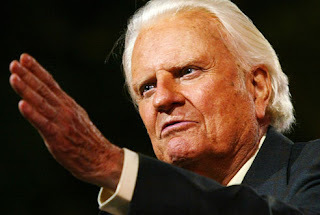 Anyway The Next Evangelist is promoting itself as a way to find the next great national speaker and evangelist comparable to Billy Graham and Martin Luther King Jr. I kind of like the concept, but still am not sure. (This coming from the guy who presented an idea similar to this in jest during several conversations, but I called it Last Preacher Standing.) I see potential good things that may come out of this and I see some troubling sticking points. One of the Good things I see is that someone has acknowledged that there is a need for a strong voice in this world for Christ, and is trying to do something about it. The voices of King, Graham, Sunday, Edwards, Wesley, and other great men and women of God are fading fast from the public ear. They have become relegated to quotes in books, sermons, and random pointless facebook postings. Their words have been diluted by our culture and often misused and misquoted. Instead of calling the people to repentance, they are cut and pasted to make us feel good about ourselves. There is a need for the voice of God to be heard again on a large scale. It needs to come from some source that the people will actually hear and listen to. I think we have several preachers on the public scale who don't say what needs to be said and hide the Gospel in a story and a smile, or they have said what needs to be said in such a way that they have become a nuisance a caricature of what a true evangelist needs to be. Usually filled with anger and wrath of God yet missing the passion and love of God. So yes there needs to be a voice that speaks loudly and with authority to call the world to repentance. Another Good thing is that the founders of this site are trying to draw attention to the social problems of this nation. A post on their facebook page says: "One of our goals with the show is to address the big problems we see in our society...the ones nobody wants to discuss." There are many ideas as to what these big problems are, and they are right, there are a lot of things that the church has handled wrong and other things to which it has turned a blind eye. So much so that the world thinks that we don't care about certain issues and are an annoyance concerning others. It may be good to show the church that it should be caring about the world around it and should see things through a different perspective. 1. Will this approach be viewed by the world and the church as a satirical commentary saying that those Christians are once again taking something that was created and popularized by the world and trying to jump on the bandwagon for attention and credit? 2. Is a competition really the best way to achieve their goals? I have seen competition shows, and the prize is not as important as winning. For instance the Bachelorette becomes less about forming a lasting relationship with a beautiful woman and more about beating the rest of the guys and shaming them. My problem is will the message of the Gospel get lost in the egos and personas of the preachers who are preaching the Gospel, and this event becomes more about the participants trying to outdo each other to eliminate their "competitors," ignoring and using the masses of people who need to hear the Gospel for their own edification. 3. Is this Spirit led or human led? Is this how God will choose the next prophet for this country? God has done stranger things and have chosen lesser men in more unique ways. I think of Amos the farmer, Jeremiah the priest, Hosea who married a prostitute, David a shepherd, John the Baptist who lived like a wildman, Peter a fisherman, Paul who was set to kill all Christians, Matthew a tax collector, and the list goes on. Time and time again God chose men in unique ways to do what needed to be done. Is this just another one of those ways? Regardless of the good things and problems, I am going to keep my eye on this venture called The Next Evangelist. It may be that God has a plan to do something great with it, or it may flop and never become more than an idea. We shall see.